The new moon in Aquarius coincides with a solar eclipse the day after Valentine’s Day, this Thursday, February 15. For millions of people around the planet, this is also the New Year. This new moon takes place in a month where there is no full moon. There will be two full moons in March. A month with no full moon was sometimes referred to as a dark month, or a black moon. This is a time for introspection, for reflecting on what needs to shift or change internally, before making what could be some sweeping external changes in March. There are many myths about the constellation of Aquarius. Babylonians called this constellation “The Great One,” and associated it with their floods and flooding season. Water bearing was an occupation that, in ancient times, was important, as water cleansed, revived, and brought new life. A common myth in Greek mythology is that the water bearer who came to be known as Aquarius was, in fact, Ganymede, a boy that Zeus kidnapped to be his attendant and consort on Mount Olympus. The boy spied his home village undergoing a drought, so poured his water through the heavens to save them. This particular myth reminds us that healing can be disruptive. It requires bravery, strength, and fortitude. Speaking up can be healing. And while healing is incredibly personal, we need one another through the process. This myth reminds us that our actions are connected to the greater collective — another Aquarian trait. At this new moon solar eclipse, consider what needs to be cleansed, cleaned, cleared, and revived. Set the intention that your dreams are also connected to the whole, even if you can’t quite connect the dots at this moment. Eclipse seasons have the potential to be rocky, even for the most centered of us. That is, in part, because a slight interruption in the regularly scheduled order of the cosmos can affect our own reverberations. If we are always in the service of evolution, then we are always in the process of transforming. If we are always in the process of transforming, there will bound to be levels of uncomfortableness. Being uncomfortable is usually a sign of being in unfamiliar territory. Shadows are what is happening at an eclipse. Shadow work is all about the Ego, and shadow work is where we can do the most healing. Shadow work is where our subconscious resides: our fears, anxieties, worries, and automatic patterns. During eclipse time, we can bring our shadows into clearer focus. We can attend to our subconscious with consciousness and awareness, and shift them. We can make new choices. We can always change. We always have choices. Eclipse season heralds endings and beginnings. Patterns that are no longer serving us can be cleared away. Doors that open up to fresh starts and more expansive paths can be opened. Be mindful now of any behaviors or patterns that need your attention. Trust that anything leaving your life will, in time, serve as a clearing for something better. Trust in your ability to take care of yourself in the process. This can be a time of great release if we allow ourselves to notice patterns and notice our behaviors. If we allow ourselves to move through our suffering, to name what needs love, and to listen to what needs attention, we can feel relief. If we allow ourselves to treat ourselves differently, more lovingly, we can make changes. Remember: things come up to come out. If things are coming up that are uncomfortable, deal with them. These patterns are trying to get your attention in the spirit of positive change. Be sensitive and compassionate to yourself during this time. 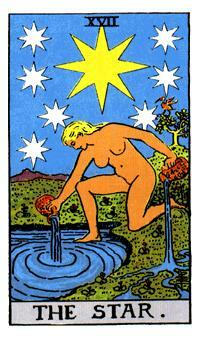 The Tarot card that is associated with the sign of Aquarius is the Star. In the traditional Rider-Waite deck, an ibis bird is positioned in the background of the Star card. The ibis is the first to leave before a storm hits, and the first to come back. This card represents a homecoming to ourselves after many travails. It represents the true healing that can take place when we allow ourselves to be as vulnerable as we can be, truly laid bare to bask in the beams of starlight and nurtured by the cleansing waters of an unwavering source. We may be finding ourselves at the precipice of a new dawn. This new moon can symbolize the hope of the new, the relief of finding a different way forward. Alone in the night, the Star is aligned with her purpose. When we give away as much as we take and nourish as much as we allow ourselves to be nourished, there’s a smooth balance, an equilibrium. We don’t hesitate to cry to our friend because, next time, it is our pleasure to listen to her tears. We feel fine about asking our roommate to cook because, next week, we’ll bring home takeout, no problem. That’s what this card illustrates. Glimmering tides lapping gently at shores. The whoosh of a grey wing rustling on the wind. Being carried by the trust that what we receive is matched by what we give. If you need to do work around expectations of yourself or others, if there is clearing that needs to be done, if it is time to ask for more help in general in your life, this card can indicate that now is an opportune time to do so. The Star card also illustrates rest and healing, and if it is time for you to take a dedicated break, please find a hot tub or spa this weekend. Make an acupuncture appointment. Allow your brain chemistry to rest in meditation or dreaming. Lie on your floor, listening to music. The Star exhibits an undying hope for the future. Freed from the limitations and chaos of the Tower, the card that comes right before, the figure is naked, unmasked, replenished, with nothing to hide. She gazes softly at her visage in the reflected water, able to see clearly for the first time in a great while. The eight stars above her provide light and inspiration. Tonight and this weekend could be an optimal time to create, to make art, poetry, songs, or strategies. Look high above your head for clarity and insights. Pay attention to the pin cushions of light that poke through the velvety-cold new moon sky. Know that the same matter that floats in the cosmos can be found in your body, your cells. The Star reminds us to move forward into the legacies of our higher purpose. Know that there is healing and hope available to you. Know that there is hope in healing. Your intentions at this time could be very simple, yet profound and joyful. To do something you’ve wanted to do for a long time: read a book, write a book, make a phone call, make an apology. Get a new haircut, wear brighter lipstick. Take a dance class, an herbal class, donate old clothes, start a savings account, research therapists. Begin a morning ritual or meditation practice. Try to start one or two activities, or do one or two things, that, down the line, could have a greater impact on your life. Know that you deserve to be the star of your own life. What might be ready to be looked at or dealt with that is painful, but necessary? How am I a shining star? How can I show that more, to myself, to others, to the world? As you run the water for your bath or shower, ground and center yourself in your body. Envision what you want to invoke during this next cycle. Imagine it filling you up with colors, sensations, and images. Place the herbs, salt, and crystals in the bath, and light your candle(s). Turn out all the lights. Slip into the bath and get relaxed, emptying your mind. Begin scrubbing as much of your body as you can, from your toes up to your neck. Once you’ve sloughed a bunch of cells off, re-center. Spend as much time as you need invoking your desires and your new story into your body. Imagine the light of the candle on the wall as the projector of your new movie. Try to visualize your dreams and new behaviors onto the light. Take as long as you need to make some of the scenes become forms in the flame. Allow yourself to feel hopeful, happy, excited, and centered in lovely feelings, thoughts, and feelings. Stay in the water until you feel a shift in your spirit. Thank yourself, your guides, the universe. For a few days after your shower, you may wish to light candles, and daydream and vision next to them to continue on with your intentions. This ritual was adapted from Many Moons, a workbook to guide readers through the Moon’s phases. Buy your copy here.